The Goldfinch, painted by Carel Fabritius in 1654, is small but perfectly formed and is one of the most popular exhibits at the Mauritshuis in The Hague. Hanneke Sanou takes a look at this intriguing little bird and discovers some interesting facts about it. 1 Who’s a clever bird? The small wooden panel (it measures 33.5 by 22.8 cm) is a portrait of the painter’s pet goldfinch. The Dutch name of the painting is ‘Het Puttertje’ from the verb ‘putten’, or to draw. It refers to the fact that the ingenious little finch was able to draw water from a reservoir using a tiny bucket. But by 2003 the Goldfinch didn’t look quite as chirpy and its yellowing varnish was removed, revealing the ‘deadly pale wall’ described by Thoré-Bürger on which the finch’s perch is mounted. The whole restoration process was transmitted live via the internet. The function of the wooden panel is unknown. Was it a little door concealing another painting, or a very clever trompe l’oeil to take people in? Nobody knows. Carel Fabritius lived from 1622 to 1654 but managed to carve out quite a reputation for himself during his short life. He studied under Rembrandt, was favoured by the court of Orange and praised for the cunning perspective in his murals. Fabritius is said to have turned away from the darker tones of Rembrandt to introduce the lightness and stillness which also characterise Vermeer, who owned several paintings by him. In 1654 it all came to a very sudden and noisy end when the gunpowder arsenal near the painter’s house in Delft blew up just as he was working on a portrait of church deacon Simon Decker. Decker, Fabritius’ mother-in-law, his brother and one of his pupils all died in the blast. Fabritius was dug out alive after seven hours but perished shortly afterwards. When the Mauritshuis gave the painting its overhaul in 2003 curators noticed a number of small indentations in the painting’s surface ‘as if it had been pelted with something’ (Davis) giving credence to the story that the Goldfinch had indeed miraculously survived the blast and had been recently painted when it took a shower of debris. The goldfinch is a widely used symbol in early religious paintings. There it represents endurance and salvation. Later artists, such as writer Charles Dickens, used the fettered goldfinch to symbolise slavery. 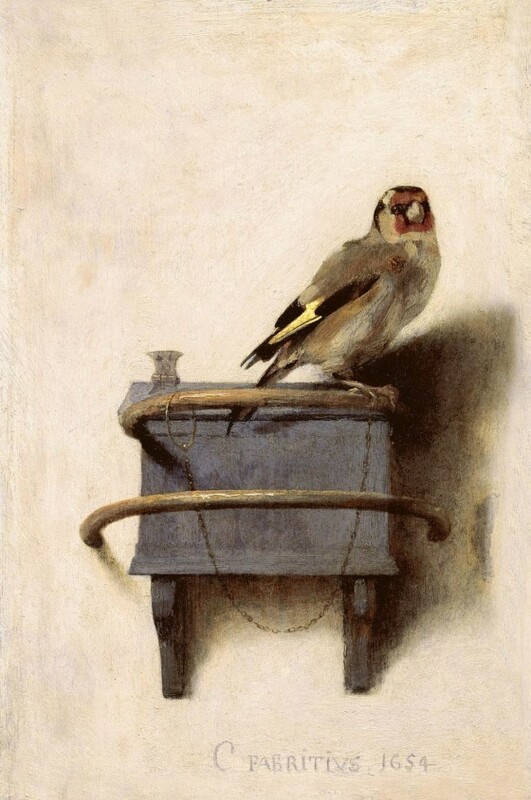 Fabritius’ goldfinch sitting quietly on its perch does not invite such an interpretation, although Thoré-Brüger described it as sitting on its ‘case d’esclave’, its slave hut (Davis). The publication of Tartt’s novel coincided with an exhibition at the Frick Collection in New York of which the Goldfinch was a part. The book caused a sensation and a record 61,000 people came to see the Goldfinch for themselves. Today, 15 of Fabritius’ paintings remain but according to art critic Cees Straus more may come to light. There are a number of potential candidates which may yet be added to the artist’s oeuvre.